We have had many requests for a breast cancer ornament. 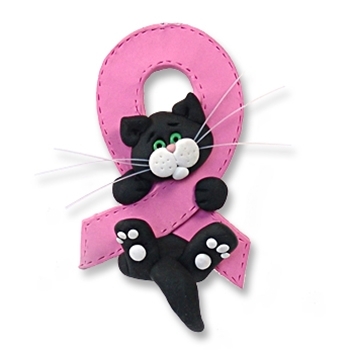 My Wacky Whisker kitty seemed to be the perfect choice for the breast cancer pink ribbon. He is a ray of hope for any cancer survivor or a memorial for someone who has passed on. May be personalized with name, message and year. Choose your favorite or collect them all! Handmade from polymer clay and designed by Debi Allison. Comes complete with hook and satin ribbon for hanging.